The Forum has a strategic focus on advancing racial equity, diversity and inclusion in philanthropy by leveraging the power of our expanding nationwide network of regional and national philanthropy-serving organizations (PSOs). We provide programming on racial equity, diversity and inclusion for people working at PSOs through our annual conference, webinars and in other ways. We are also focused on helping PSOs provide funders with effective resources, programming and strategies to advance racial equity, diversity and inclusion in philanthropy, guided by a new Racial Equity Working Group. The Forum was a partner in the D5 coalition, a five-year effort organized by a coalition of foundations and associations to galvanize philanthropy’s work on diversity, equity and inclusion. D5 sought to leverage the collective knowledge, experience, and action of more than 17 organizations, representing thousands of foundations. Orange County Grantmakers, in partnership with the St. Joseph Health Community Partnership Fund, has released a new report providing an equity analysis of the Orange County region. In this video, our members share some of their strategies and thinking behind their ongoing racial equity work, as well as some of their struggles and successes. United Philanthropy Forum works to advance racial equity in philanthropy. We asked our members and colleagues how they define racial equity and this video contains some of their responses. Grant Oliphant - What Does Courageous Philanthropy Look Like? Grant Oliphant, President & CEO of The Heinz Endowments, gave an inspiring keynote presentation at the 2018 Forum Annual Conference in Boston, MA on July 17. He is a vocal and outspoken philanthropy leader who stresses the importance of foundations speaking out against government policies and decisions that are at odds with their work. Dr. Ibram X. Kendi, Professor of History and International Relations and the Founding Director of the Antiracist Research and Policy Center at American University, shared key concepts from his New York Times-bestselling book Stamped from the Beginning: The Definitive History of Racist Ideas in America. Richard Rothstein, Research Associate of the Economic Policy Institute and a fellow at the Thurgood Marshall Institute of the NAACP Legal Defense Fund and the Haas Institute at the University of California (Berkeley) and author of The Color of Law: A Forgotten History of How our Government Segregated America. Rothstein surfaces the forgotten history of how federal, state and local policy explicitly segregated metropolitan areas nationwide. Dr. Elizabeth Hinton (@elizabhinton), Assistant Professor of History and African and African American Studies at Harvard University and author of the award-winning book From the War on Poverty to the War on Crime: The Making of Mass Incarceration in America. Dr. Hinton examined the persistence of poverty and racial inequality in the 20th century United States. Based on extensive research and experience emerging from its Transforming Michigan Philanthropy initiative, Council of Michigan Foundations developed this discussion guide and assessment tool to help foundation leaders begin essential conversations about the power of differences and determine the level of their organization’s readiness for growth. Available in PDF for the first time, this easy-to-reference primer shortens the traditional learning curve that empowers donors, volunteers and others to become active leaders in nonprofits. The book covers essentials such as assessing nonprofits’ effectiveness; the roles of staff, boards and donors; and the importance of fundraising and preparation for the future. Quick takes on nonprofit strategies, structures, and best practices are interspersed with short essays. 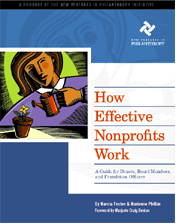 Applicable to both new and experienced nonprofit supporters, it blends practical information with analytical perspectives from experts in the field.